When I was at primary school at Llanfair PG, we used to be taken for a swim, by coach, to a swimming pool in Beaumaris. I think it was where the old David Hughes schoolhouse is now. It must have gone long ago, or maybe I'm wrong about the location. But I used to love going there, running out of the coach to get changed, swimming up and down in a ill fitting bikini and then running back into the coach after our swim. We usually seemed to have sweets to eat on the way back to school. It was just a nice, happy time. Does anyone else remember the pool? Thank you very much for writing to share your Anglesey memories. Ahhh.. Beaumaris. I love Beaumaris. Such a delightful little town with its unique ancient history and fabulous eateries. It just struck me a moment ago that you just might be talking about the swimming pool in what is now the leisure centre. The one next to the castle? I remember it, though I never managed to have a swim there. I don't think the pool's there now. Laid waste when they developed the tasteful little centre, I imagine. There are no signs indicating a pool, anyway. Initially, I thought you were talking about the old, old Victorian outdoor, tidal swimming pool that caused a bit of a wobbly for one of the Island's 'unique' county councillors. There were rumours that it was going mto be opened again (Click Here and scroll down). I think that was the town councillors seeking to generate momentum for a good idea. Came to nothing, sadly. Sweets and soggy white bread tomato sandwiches always seemed to be part of my childhood school trips. Thanks for writing in. It got me remembering as well, which is what my site is all about. 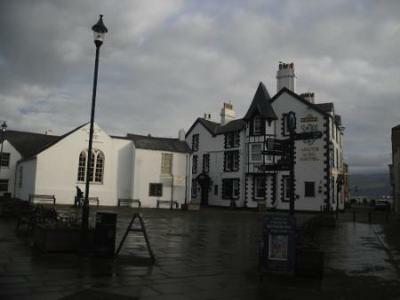 Just think Beaumaris has been ruined just for the sake of summer visitors. For example, the pier we once had its not a pier any more just a piece of wood jutting out to sea the swimming pool just a place to dump your rubbish years ago. Fair play for the late Hugh Clock it was his pride and joy to keep it clean and to change the water when ever he thought there was need to. I was just being nostalgic and was looking for the old outdoor pool at Beaumaris. We used to go and stay at Red Wharf Bay with the Red Cross camping in the summer, and one of my favourite haunts was the outdoor pool. It was situated by the coast, it jutted out on its own, and had a stone wall around it. The water was extremely cold and it was quite deep, but so much fun. Happy memories. Thank you very much for your input. I remember the old pool but never managed to get an, opportunity to swim there. I remember that the fourth year of primary school in Llangefni went there for a week and came back with fantastic tales of adventures and girls they fancied. Sadly, I was unwell with my asthma and missed all that. Made up for the adventure later on when I discovered mountains, cliffs and surfing. Thanks for being touch. Do pop back if you've any more stories to share. I was an Instructor at the outdoor education centre in Beaumaris . We had a small indoor swimming pool in what was once a classroom in the old school which has now been changed into the health centre. Lots of local children learnt to swim there as well as sail, climb, camp and canoe. Hope this is of some help in remembering the old pool. I remember the swimming pool and sure it was on the front near the green and the big hill with wonderful views to the mainland.I went swimming in it sure it was sea water it was a bit chilly to say the least.I'd come with my dad the summer holidays before I started at senior school.We stayed with my Uncle Pat and Auntie Phyllis(Murphy) in Ty Ceiliog on Red Hill. Wil, Martin here, what can I say... there I was surfing the web and found my way to your site, an obvious labour of love. My five sisters and I lived on Anglesey for a couple of years in the 60s (Aug 1963 to Aug 1965). We lived at Rhos Newydd near Glan-yr-afon and LLangoed. My elder sister Siân and I attended David Hughes School at Menai Bridge. The green Crossville buses carried us to school from Llangoed school to Menia. We sang raucous pop songs at the top of our young voices - the Beatles, Searchers, Gerry and the Pacemakers, Freddie and the Dreamers heard on Radio Luxemburg and then from 1964 pirate Radio Caroline .. 199 Caroline! anyone recall that? This went on for a while until my mother couldn't stand it anymore. She stopped talking English to the lady behind the counter and turned to the old biddies and, in perfect Welsh, suggested to them that in future if they feel the need to gossip about someone right there in the same room as them it would be better if they were sure that they couldn't understand the language! You could have heard a pin drop. This piece of news spread like wildfire - 'be careful, 'the newcomers they aren't English at all!, they're Welsh' just sound and act like English. It was a hoot. Royal Charter from our bedrooms we would look out over Red Wharf Bay and Moelfre, reflect on the wreck of the Royal Charter and imagine how awful it was for the hundreds who lost their lives so near to shore. I've seen the sea there - the storms are truly incredible, what a fierce, magical, and beautiful place Sir Fôn is. I love returning to visit - thank you all for letting me rant! How absolutely marvellous to hear from you. I am so glad that you called by. I actually remember a pool at the Leisure centre in Beaumaris. They also had one in canteen in the old Ysgol British primary school in Llangefni. This would have been about early 1970s. All the local schools would visit it in turn. The Beaumaris tidal swimming pool is not a place I'd go swimming these days, though I think my Dad might have swum there when he was a kid. They also used to have a similar tidal pool in Bangor. It's on the banks of the Menai Straits below the Eisteddfod stones on Siliwen Road down to the pier. Do call back, Martin. Sorry I haven't been in touch for a while. Family health issues that won't go away. Swimming and Leisure Center (ex DHS) at Beaumaris. From my recollections 1963 thru 1966 the only swimming pool at Beaumaris I recall was the tidal pool that Wil mentions near the castle it was on the road to Llangoed and Penmon. I can’t recall if it was open then when I was there but I think not, as I don’t recall ever swimming in it. By my time the old Beaumaris David Hughes School (DHS) had closed replaced by he new Comprehensive School (very 1st in the UK, I think) opened at Menai Bridge in early 1963 (or maybe late 1962). The only pool I recall in the general area was the new one at Bangor which I think opened in 1966. I don’t recall there being a pool at the ex DHS now the leisure center. If it had existed I probably would have known about it as I was a keen swimmer. As an aside I’ve actually swam the entire bay of White Beach (300 yards maybe) and let me tell you the water is freezing even in July/Aug… so cold you take involuntary gasps when you dive in. As to the leisure center, I and my Llangoed and Beaumaris pals really had fun there. During the off season (winter) our youth club (Llangoed) would arrange for us to stay over the weekends at a cost of 10 bob for two days all accommodation, activities and equipment and meals included. I recall mountain hiking in Snowdonia in Feb and - get this - canoeing in the Menai from Beaumaris pier. Now both these activities were wet and cold experiences. But we loved it, then when we returned to the center we had the luxury of hot steaming showers followed by great meals and evening activities. We loved it. Ponies. Any one recall that if you had facilities you could host a pony over the winter season? It cost three pounds 10 shillings for insurance. You had to be able to take care of the ponies properly meaning stables etc.. but you had the pleasure of riding for about 4 to 5 months. Martin Davies ex Glanrafon now St Louis MO.